So this morning I was up at 6am, which is still 3:30am according to the timezone I’m acclimatised to, but getting out of bed early to spend the day riding with friends never seems as hard as getting up for work. It’s dripping fine droplets of rain from time to time, enough to warrant throwing on the wet covers again, but enough to ride in quite happily. 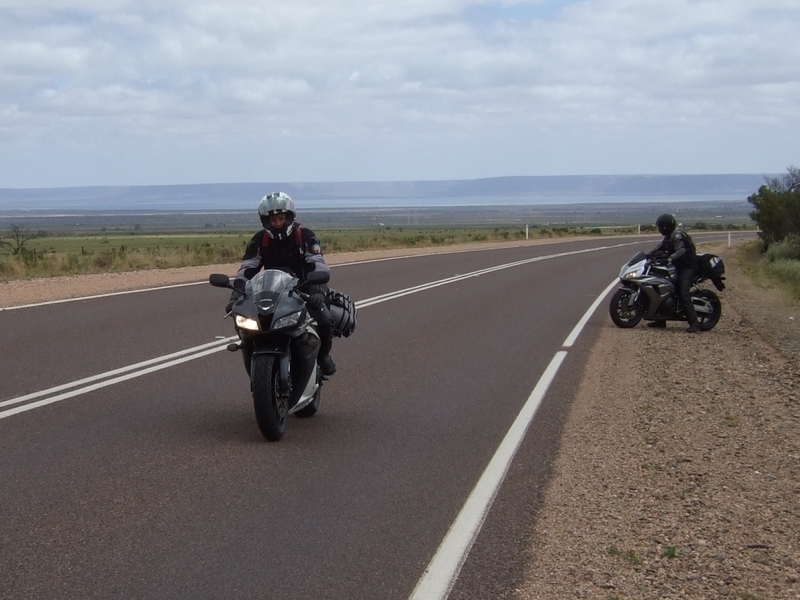 We load up and roll out back along the Eyre Highway with the aim of hitting Murray Bridge by nightfall, which is just on the Eastern side of Adelaide. A couple of hundred kilometres down the road we stop for fuel and breakfast at Wudinna. Looking through the roadhouse warming trays, I opt for a Chiko roll and a coffee spat from a self-serve machine. It’s amazing how fussy you’re not about your coffee when you really need one. I decide the drag from the weather covers on the luggage is probably worse than the possibility of slightly wet luggage, so I pack them in for the day. 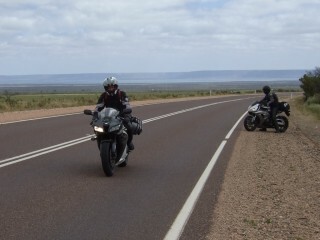 We roll along through Kimba and Iron Knob (tee hee) until we stop for a light lunch at Port Augusta, where, after about a thousand miles or so, we finally get off the Eyre Highway. As we’re headed out of town along another boring highway, I start to daydream about the hills I can see off to my left and what lovely roads there must be through there. Suddenly, as if a gift, Warren (who is leading) indicates left, and we turn off to head straight for the hills. When we reach the foot of the hills, we pass a sign saying “Horrock’s Pass” and every one of the two thousand kilometres I’ve just travelled in a straight line suddenly disappear, and I am surrounded by biking magic. The road is tight and twisty, along the rise and falls of the hills and across the gaps and valleys, beautifully smooth and totally engaging. The glimpses I take of the scenery are fantastic, crumbled old houses in green fields overtaken by flora… Ooh! A horsey! 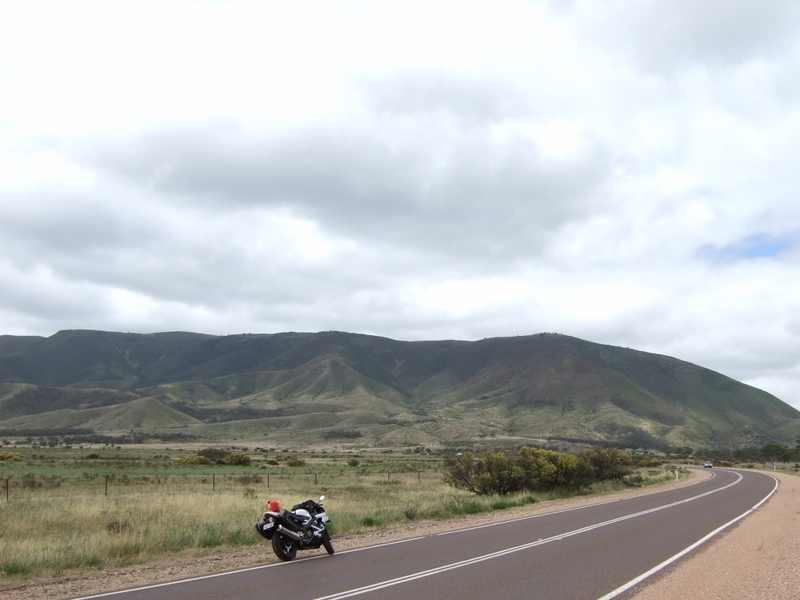 I love this road, I love motorcycles, I love this trip, I love the back of a caravan. What? No. Wait. Just before the end of the twisty bits we pull up behind a caravan moving deadly slow, and on a road this tight there is nowhere to safely pass, so we dawdle along until the road opens up and we can pass the caravan, who I recognise as one we’ve passed twice already today (bikes need to stop for fuel more frequently than cars you see). We spend the next couple of hours traversing the South Australian countryside, passing through vineyards, small towns and every shade of green, yellow and brown believable as we move through the pastoral area, some cleared entirely, others bursting with crops and flowers, some so inconceivably thick with Paterson’s Curse that they seem to be solidly purple in colour. 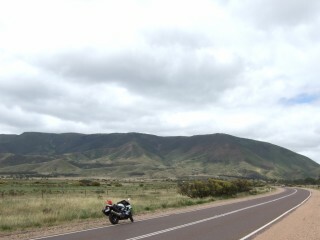 As we hit the hilly surrounds of Adelaide we move through a place called Gawler where we take some back roads through the town until we turn sharply up a hill and past a sign that reads “Dead Man’s Pass”. Synapses fire in all kinds of places in my brain. This sounds like a whole lotta fun. It has been raining, so the roads are wet, but still grippy, and just phenomenal. They weave and duck around the edges of cliffs and drops, through forests and along creeks. The sights are gorgeous and the surface is smooth and clean. I am having a ball. I get the occasional startle from drivers coming the other way who seem to be travelling at warp nine. An SUV comes flying over the top of a crest at the top of its shocks while a blue ute hits the anchors suddenly and squeals around a tight bend next to me. When we pull up for fuel I ask two of my friends (who have led us this way thanks to years living in these parts) if many people come to grief along these roads, which as wonderful as they are, could easily be taken a bit too quick. They tell me that the locals just drive that way, they’ve grown up their whole lives driving around here, come and go every day on their way to the city, and they just know how to drive. It seems a bit of a shock to me (coming from Perth), but I find it hard to deny after I watch a little old lady in a purple Suzuki Vitara hit the perfect apex on a downhill, decreasing radius corner as we’re heading the other way. This place is awesome. We snake our way through Woodside, Balhannah and Nairne until we finally arrive at Murray Bridge. A local motel rents us a house, where I stick my bike in the shed before realising we need to ride to get dinner. Robyn (one of my trip family) gives me a dink on the back of her 600RR on the way to the pub, where we find a large number of tipsy locals wearing hats after a day at the races. A tasty meal later and we throw some clothes in the washer and zone out in front of the TV for a bit before bed. Well, the plan was to zone out, but I find myself intrigued by a real-life crime re-enactment show where a girl I used to do some acting with is playing a woman who gets mugged, beaten, thrown in the boot of a car and then beaten up some more before being stabbed to death. I guess you can’t hit the blockbusters from the get-go. Tomorrow we hit Victoria on the way to somewhere called Camperdown, which I have never heard of, let alone have a clue as to the location of. Should be an interesting day.